you probably do not want to invest in a pair of smooth-soled road cycling shoes that will make walking distances difficult. In that same token, you do not want a large, waterproof boot style road biking shoes weighing you down on long road treks causing wind drag, decreased power to your pedals and inflexibility at the ankles. Even for the experienced cyclist picking out the right pair of shoes to enhance your bicycling experience can be a little overwhelming, and we’re here to help narrow down the choices. There are a lot of factors to consider when selecting the best road bike or specific cycling shoes for you. Below is a list to help consider the different factors to give you the best fit for your needs, your goals, and your fitness lifestyle. Athlete’s foot, cracked skin, toenail issues. No one wants to experience these, and one of the first things to consider in your cycling shoes is proper ventilation. Aside from keeping you comfortable on a hot day, proper air circulation helps keep bacteria levels down, shoe smell in check and increases the life of your shoe by inhibiting acidic sweat soaking into the materials. Air circulation varies in the style of a cycling shoe. The best road bike shoes typically have some mesh or netting in the upper portion of the shoe as well as holes cut into the soles for complete foot surface ventilation. For winter road biking or mountain biking you may select cycling shoes that are more of a boot style with a waterproof upper, thick lining and sealing cuffs, thus having less breathability, but a higher level of insulation from the cold and surrounding environment. Road bike shoes are similar to all other shoes in the aspect you can find them in nearly any type of upper material. Enthusiasts claim that the most glove-like and supple feeling comes from high-end leather, but that is also on the high end of the price spectrum and does not offer the same ventilation as other materials. The thing to keep in mind about the material is how the shoe will be used. Leather upper may feel fantastic road biking in winter, but maybe scuffed and damaged easily trekking up rough terrain while mountain biking. A thin mesh and textile upper offers cooler coverage in summer, and thick materials are better for waterproofing. » Do Laces Like A Safe Place? One of the terms you will run across in cycling shoes is the lace garage. Like it sounds, this is a place you can park your laces to keep them, and you, safe. There are lace pockets, straps that cover the lacing bow and cutaways on the side of some shoe tongues to tuck the laces. Lacing comes in much more advanced varieties than it did twenty years ago with speed lace tabs for mountain bike shoes, non-slip lacing for road bike shoes and an entire assortment of hole placement designs to get you into the best fit possible with a shoestring. One of the best ways to get a customized shoe fit is the adjustable tightening systems. This includes not only laces but buckles, ratcheting straps, Velcro, and snaps. Velcro is the lightest weight, soft with no abrasive contact points, reliable and can be exceptionally strong. Velcro is a great fastener, but mountain bike shoes exposed to a lot of mud, gritty sand and water which can weaken it holds considerably. In contrast, ratchet straps are immune to mud and water, allow easy adjustment on the move and have a firm hold. However, buckles and ratchet straps can be bulky sometimes and may have an uncomfortable contact point if hit. If you are unsure about your specific needs, we recommend as a general rule for safe fastening two Velcro straps on the toe end of the shoe and one ratchet strap towards the leg for weather-immune hold. This is faster and more adjustable than traditional lacing while also providing three holding points to keep the shoe firmly on your foot. Excepting the case of mountain biking where a durable lugged sole (equals heavier) is a good thing, the lighter the weight of a cycling shoe, the better. Less weight means less muscle fatigue, less drag and more power transfer to the pedal. The material and treading on the cycling shoe sole is the greatest factor in weight with fiber-soled road bike shoes weighing as little as 400 grams and rubber-soled mountain bike shoes ballooning in at 850 to 900 grams. Injection-molded plastic –This is an economical answer to carbon fiber, can be molded for a formed fit and is prone to mild flexibility. Plastic Composites – Carbon Fiber/ plastic combos and plastic/fiberglass combos are more economical than carbon fiber and slightly more flexible depending on the composite mix. Nylon –Comparable to plastic composite regarding the ability to mold custom forms, but of higher quality making next in line to carbon regarding fit and stiffness. Carbon Fiber–The cream of the crop. Nearly all of the top quality competition level shoes made in the last 15 years use carbon fiber soles, known for their durability, light weight, and stiffness. Mountain Bike shoe soles have a little flex in the toe area for walking and climbing and are plastic, composite, or rubber based. Mountain Bike Racing shoe soles have less flexibility and are primarily carbon fiber based. Road bike shoe soles are exceptionally stiff soled. Casual cycling shoes are flexible for comfortable walking. The modern answer to a toe clip and strap that traps your cycling shoe in a metal cage (think Silence of the Lambs for your shoe) on the pedal is the clipless pedal system. The old strap system was slightly awkward and dangerous owing to the fact the rider had to bend over and manually loosen the strap to remove their shoe from the pedal. Modern cycling pedals and shoe cleats work hand-in-hand to clip together so that your upward pull on the pedal is as effective as your down-stroke. It means twice the potential power, resulting in more energy efficiency and speed. Many manufacturers are producing these types of systems so cycling shoes often offer a threaded hole in the sole to attach different cleats for different pedal styles. The cleats on your shoes will match the specific pedals you are using, and are not usually compatible with different pedal systems. Mountain bike cleats are generally small and nestle inside the sole of the shoe using a two-bolt mounting system. They are designed with this recessed cleat to make walking easier when dismounted. Road bike cleats are often wide, giving good power transfer to the pedals, but making walking somewhat difficult. Some cycling shoes offer optional toe studs which come in pairs and are fitted on the nose of your sole. You can also purchase screw-in studs or spikes for hiking muddy trails if your mountain bike shoe is compatible. They give extra grip for smooth-soled cycling shoes for running your bike uphill. Some cycling shoes offer a replacement heel grip because the heel of the shoe grinds away over time if you place your feet down while the bike is still in motion. These are not crucial points in new cycling shoes but a great bonus if they are included. Another cycling shoe accessory is rubber cleat covers which make walking much comfortable and save your cleats from wearing down when you are forced to get off the bike. Note: Studs, cleats and heel grips can cause damage to indoor flooring surfaces such as hardwood and tile. Your biggest consideration is how you intend to use your cycling shoes. Do you ride in town to do quick errands and light grocery shopping? We recommend casual cycling shoes that resemble sneakers and provide easy cycling and walking. Do you like trekking up rugged dirt trails and stopping to admire the view? We recommend semi-flexible rubber-soled mountain bike shoes with recessed cleats, so walking and hiking is comfortable. Do you ride in long distance competitions? We recommend stiff soles for high power transfer to the pedals and an overall lightweight shoe. Figure out all possible scenarios you will put your shoes through and find a pair with the features that will enhance your cycling lifestyle. Slightly angled with a 4mm drop from the heel to the toe for increased walking stability, these Reebok’s provide a comfortable fit. They come with RopePro protection wrap to cover the lace-up front for a snug and safe fit. The Crossfit Nano also features a cushioned footbed, and shock pads in the forefoot and heel, plus fabric lining for comfort and breathability.The multi-surfaced rubber outsole is great for traction both pedaling and walking. The Giro Rumble VR MTBs designed for high performance on and off your bike. The vibram rubber outsole grabs flat pedals while providing enough flexibility and high-traction grip for walking comfort. The molded EVA footbed and contoured midsole offer ample cushioned support. The upper material is a microfiber mesh combo that promotes breathability. This is a front lacing shoe with easy-to-adjust placement and non-slip laces. These Venzo Mountain Bike Bicycle Cycling Shimano SPD Shoes offered the best of both worlds with a low-cut build for maneuverability and decreased overall weight. The Venzo Mountain Bike Shimano SPD Cycling Shoes have fast drying breathable mesh and synthetic textile for the upper, and a breathable fabric lining with an additional sock liner that can be removed and washed. It offers a beveled heel and one of the most flexible forefoot constructions in a cycling shoe for your off-bike fitness needs. Known as the Brand of the Brave, Five Ten mastered another awesome leather sneaker called the Five Ten Men’s Freerider Sneaker. The Freerider sneakers were completely inspired by the free-spirited BMX bike. Five Ten is known for their high-friction footwear made with proprietary Stealth rubber soles for close to 30 years. They are industry favorite for great sports footwear and operate with world-class rubber-testing and a superior research and design facility. The Freerider sneakers live up to the brand name with the tree-frog like grip of their STEALTH S1 rubber outsole. The high-quality leather mixes upper seals tightly with quality front lacing. The same company that brought you the Freerider Sneaker has designed the Freedrider Contact Bike shoe. Known for creating shoes for athletes competing in the world’s most dangerous sports, Five Ten has upgraded theFreeriderVXi to feature their proprietary Stealth Mi6 sole rubber. The Freerider Contact Bike shoe has a stiff midsole, reinforced toe protection and a Contact Outsole designed for rigorous riding. The Pearl Izumi X-Alp Seek V Cycling shoe is a mountain bike shoe designed from Pearl Izumi’s award-winning syncroSeek running shoe. What makes this model a high performing cycling shoe is the recessed cleat mount and mini-shank in the sole to mount a 2-bolt MTB cleat. The carbon lugged rubber outsole has incredible traction and the insole packed with Energy foam, known for its fantastic shock absorption.The breathable upper designed with the comfort and appearance of a running shoe. Built for comfort and speed this shoe is quick-drying, boasts a highly breathable mesh synthetic upper and has a low cut construction for more maneuverability and lighter weight. A nice safety feature is the built-in lace garage to lock laces in place. This Shimano SH-R065 Road Shoe is built to breathe! The Shimano SH-R065 Road Bike Shoes offer an air exchange system that keeps everything cool and dry. The Shimano Dynasties molded to hold the foot in the ideal ergonomic position for a pedaling upstroke while offering a comfortable flat cushioned insole. The rigid fiberglass polyamide composite sole transfers incredible power to the pedals and is SPD and SPD-L pedal compatible. Flat, flexible insole supports a variety of foot shapes. Dual straps for adjustable comfort and support. Matches Shimano PD-R550, PD-R540, PD-540-LA, PD-A520 Pedals. The Gavin Elite designed for performance and an exceptional fit. This cycling shoe has a small adjustable buckle that allows you that extra fine tuning to find the ultimate fit for your personal comfort and improve your performance. The material is a stylish faux microfiber leather with breathable mesh for airflow and cooling. The Gavin Elite also features a nylon fiberglass sole with air-flow vents for less resistance and cooling. The Giro Men’s Privateer Cycling shoe is go-to for racing and high-performance riding. A breathable microfiber upper boasts two adjustable straps and a ratcheting buckle for custom fitting. The nylon outsole is the stiffest in its class, offers a sturdy reinforced toe box and outclasses most competitors with its composite design. The Privateer offers dual layered lugs for exceptional traction dirt tracks and accommodates toe spikes. The footbed is molded EVA with an Aegis anti-microbial treatment. 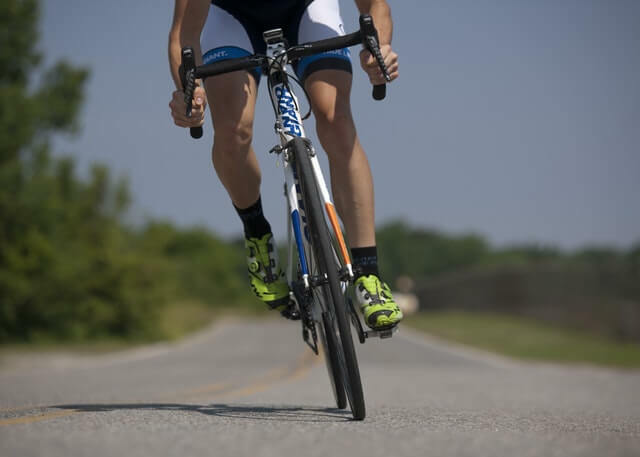 If you take your cycling seriously and want to take your road bike or mountain bike performance to the next level, picking out the best road bike shoes for your needs is an absolute necessity. We have chosen these shoes as our pick for the best road, mountain and touring bike assortment available on the market. Your shoes need to be compatible with your riding lifestyle, just as your cleats need to be compatible with your pedals! Pairing all these factors together work as a system to create maximum efficiency and enjoyment. Get cycling!